The front roof of the Maha Devala is thatched with new leaves in the traditional Athu Pandalama ceremony on the sixth day of the Kataragama Esala festival. Last morning, the sixth day of the Esala Festival in Kataragama, the traditional 'Athu Pandalama Ceremony' to thatch the front roof of the Maha Devala with new leaves took place with the participation of the Basnayake Nilame, Shashindra Rajapaksa.  The Athu Pandalama Ceremony commemorates the legend that King Dutugemunu erected a temporary shed as a token of fulfilling a vow made by him to erect a devala for God Kataragama when he marched against King Elara who ruled in Anuradhapura. The Basnayake Nilame performed the ritual by placing the first bundle of twigs brought from the jungle; he was followed by the devotees who attended the ceremony. In addition to the Athu Pandalama ritual the wattle and daub room in the Basnayake Nilame's official quarters was refurbished and an alms giving to the monks was held to commence the day's programme. The most significant event on the sixth day of the festival was the display of the tusks of King Dutugemunu's royal elephant, Kadol Etha in front of the Maha Devala. The two tusks would be on display until the water cutting ceremony is held in the early hours of July 16, 2011. Meanwhile the Veddah community performs its age old ritual of obstructing the way of the perahera that leaves for Valli Amma Devala commemorating another legend that the Veddah community of that era obstructed God Kataragama who came to meet Valliamma, a damsel of the Veddah community. A group of Veddah people including Uruwarige Vanniyala Eththo performs the ritual every day of the perahera. The Basnayake Nilame said more than 350,000 pilgrims attended the festival since it began on July 1. The Kataragama Esala Festival swings into high gear on 16 July with a series of colourful rites and rituals of Buddhist, Hindu and indigenous origins. Taken together the rites mark the Esala festival's shift into full swing in anticipation of the festival climax on Esala Poya Day. The festival's indigenous Vedda origins are represented by the annual rebuilding of the pandalama or rustic canopy of fresh branches and leaves of margosa trees. 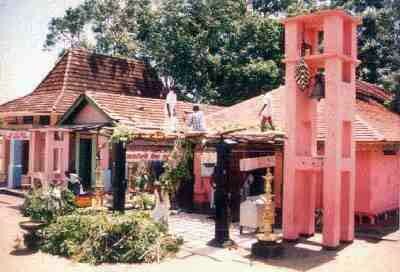 The pandalama construction, under the direction of Rajakariya ancestral experts, thus preserves the tradition of God Kataragama's original jungle shrine. At the same time in the adjoining Thevani Amman Devasthanam compound, Hindu monks of the Dasanami Order direct the ritual hoisting of a saffron kodi or flag representing renunciation, penance and purification. 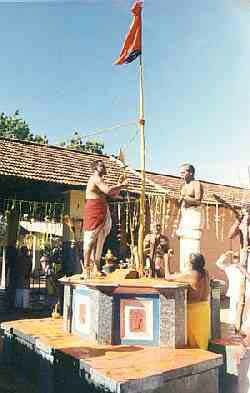 A similar flag is later raised at Muttulinga Ishwara (Sivan) Kovil. The same morning, a chamber in the Basnayake Nilame walawwa is ritually purified by applying fresh cow dung to the floor and walls. Before noon the specially prepared chamber is scene to the annual Buddhist dana and anusasana or sermon hosted by the Basnayake Nilame. That evening also features the first Esala Perahera in which the Basnayake Nilame participates in his official capacity as God Kataragama's 'prime minister'. Proceeding at a stately pace with full entourage including kapuralas, alatti ammas, torchbearers and hundreds of dancers, the God's Esala Perahera is an unforgettable sight for young and old alike. See also this article on Hindu Temple Worship by HH the Kanchi Sankaracharya.